After being stranded by the Australian Imperial Force evacuation from Greece, Australian soldier Harold Holpen found shelter in the home of the Kapetanakos family. On October 21, 1944, after over three years of protecting and building unforgettable bonds with Holpen, the Kapetanakos family said their final farewells to their foreign friend. Holpen expressed eternal gratitude to the family for courageously risking their lives by harboring him from German and Italian Forces. 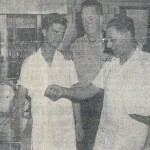 Holpen left Greece that day committed to one day repaying the Kapetanakos family for their sacrifice. Unfortunately, in 1953, the patriarch of the Kapetanakos, Elias (Louie) passed away, leaving behind a family and a farm heavily mortgaged. Upon receiving the news of Louie’s passing, Holpen nominated the Kapetankos’s 17-year-old son Vasili to become an Australian Migrant in order to find work that could support his family. Three years later, Vasili arrived in Brisbane and began work at a local café. His outstanding work ethic and dedication lead him to quickly learning the tricks of the trade, and ultimately to becoming an expert in the restaurant industry. Through many years of hard work and the determination to make a better life for his family, Vasili made the journey to America along with his brother and sister. It is there that he met his loving wife, Soulla. Together, the family opened and successfully ran a carryout restaurant in Towson, Maryland, until Vasili’s untimely death in 1983. Soulla and her family were left to provide for the couple’s two small boys. 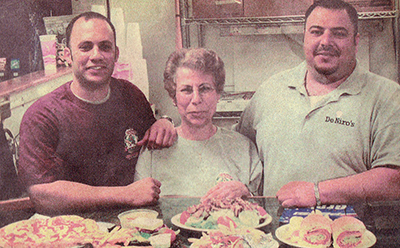 In 2002, Soulla and her boys, Leo and Van, opened DeNiro’s. The Kapetanakos family built the business with the belief that everyone should be treated as family: a value that had passed through the Kapetanakos family since Elias had originally done so for Holpen in 1941. To this day, DeNiro’s maintains low prices for its delicious food to pay tribute to the hardship that their own family experienced after Elias’s passing, and again after Vasili’s; and in recognition of the hardship that many other families may be currently facing. As a family, they honor their Father and Grandfather by continually striving to provide every patron with the best quality homemade meal and a welcoming atmosphere.